Helena Reynolds crossed the floor of the crowded taproom, her carpetbag clutched in her trembling hands. The King’s Arms was only a small coaching inn on the North Devon coast road, but it seemed to her as if every man in Christendom had gathered there to have a pint. She could feel their eyes on her as she navigated carefully through their midst. Some stares were merely curious. Others were openly assessing. She suppressed a shiver. She was hardly dressed for seduction in her gray striped-silk traveling gown, though she’d certainly made an effort to look presentable. After all, it was not every day that one met one’s future husband. “Can I help you, ma’am?” the innkeeper called to her from behind the crowded bar. “Yes. If you please, sir.” Tightening her hands on her carpetbag, she approached the high counter. A very tall man was leaning against the end of it, nursing his drink. His lean, muscular frame was shrouded in a dark wool greatcoat, his face partially hidden by his upturned collar and a tall beaver hat tipped low over his brow. She squeezed into the empty space beside him, her heavy petticoats and crinoline rustling loudly as they pressed against his leg. Before Helena could object, the innkeeper darted off to oblige his customers. She stared after him in helpless frustration. She’d been expected at one o’clock precisely. And now, after the mix-up at the train station and the delay with the accommodation coach—she cast an anxious glance at the small watch she wore pinned to the front of her bodice—it was already a quarter past two. He did not acknowledge her. He was exchanging words with the coachman at the other end of the counter as he filled five tankards with ale. The two of them were laughing together with the ease of old friends. Helena gave a soft huff of annoyance. She was accustomed to being ignored, but this was the outside of enough. Her whole life hinged on the next few moments. She looked around for someone who might assist her. Her eyes fell at once on the gentleman at her side. He didn’t appear to be a particularly friendly sort of fellow, but his height was truly commanding and surely he must have a voice to match his size. He raised his head from drinking and, very slowly, turned to look at her. The words died on Helena’s lips. He was burned. Badly burned. “Do you require something of me, ma’am?” he asked in an excruciatingly civil undertone. She stared up at him, her first impression of his appearance revising itself by the second. The burns, though severe, were limited to the bottom right side of his face, tracing a path from his cheek down to the edge of his collar and beyond it, she was sure. The rest of his face—a stern face with a strongly chiseled jaw and hawklike aquiline nose—was relatively unmarked. Not only unmarked, but with his black hair and smoke-gray eyes, actually quite devastatingly handsome. “Do you require something of me?” he asked again, more sharply this time. “Thank you, sir,” Helena said. But the gentleman had already turned his attention back to his drink, dismissing her without a word. “Yes, ma’am?” the innkeeper prompted. “The last one?” She couldn’t believe it. Mr. Boothroyd had given her the impression that she was the only woman with whom Mr. Thornhill was corresponding. And even if she wasn’t, what sort of man interviewed potential wives for his employer in the same manner one might interview applicants for a position as a maidservant or a cook? It struck her as being in extraordinarily bad taste. Was Mr. Thornhill aware of what his steward was doing? In fact, she was not at all certain. She had only ever met Mr. Finchley, the sympathetic young attorney in London. It was he who had encouraged her to come to Devon. While the sole interaction she’d had with Mr. Boothroyd and Mr. Thornhill thus far were letters—letters which she currently had safely folded within the contents of her carpetbag. “Reckon he might at that,” the innkeeper mused. He glowered. “This way.” And then, without a backward glance, he strode toward the hall. Clutching her carpetbag tightly, she trotted after him. Her heart was skittering, her pulse pounding in her ears. She prayed she wouldn’t faint before she’d even submitted to her interview. The gentleman rapped once on the door to the private parlor. It was opened by a little gray-haired man in spectacles. He peered up at the gentleman, frowned, and then, with furrowed brow, looked past him to stare at Helena herself. “As to that, Miss Reynolds—” Mr. Boothroyd broke off with an expression of dismay as the tall gentleman brushed past him to enter the private parlor. He removed his hat and coat and proceeded to take a seat by the raging fire in the hearth. Helena didn’t hear the rest of their conversation. All she could hear was the sound of her own beating heart. She didn’t know why she remained. She’d have to board the coach and continue to Cornwall. And then what? Fling herself from the cliffs, she supposed. There was no other way. Oh, what a fool she’d been to think this would work in the first place! If only Jenny had never seen that advertisement in the paper. Then she would have known months ago that there was but one means of escape from this wretched tangle. She would never have had reason to hope! Her vision clouded with tears. She turned from the private parlor, mumbling an apology to Mr. Boothroyd as she went. She looked back, confused, only to see that the other lady was gone and that Mr. Boothroyd stood alone in the entryway. From his seat by the fire, the tall gentleman ruffled a newspaper, seeming to be wholly unconcerned with either of them. “No, sir,” she said. “No, sir. I traveled alone.” There hadn’t been much choice. Jenny had to remain in London, to conceal Helena’s absence as long as possible. Helena had considered hiring someone to accompany her, but there’d been no time and precious little money to spare. Besides which, she didn’t know who she could trust. Mr. Boothroyd continued to sift through his papers. Helena wondered if he was even listening to her. “Ah. Here it is,” he said at last. “Your initial reply to the advertisement.” He withdrew a letter covered in small, even handwriting which she recognized as her own. “As well as a letter from Mr. Finchley in London with whom you met on the fifteenth.” He perused a second missive with a frown. “Is anything the matter?” she asked. “Young and beautiful,” he muttered with disapproval. Helena didn’t doubt it. She’d have balked at the prospect herself once. But much had changed in the past year—and in the past months, especially. Any girlish fantasies she’d harbored about true love were dead. In their place was a rather ruthless pragmatism. Justin Thornhill cast another brooding glance at the pale, dark-haired beauty sitting across from Boothroyd. She was slight but shapely, her modest traveling gown doing nothing to disguise the high curve of her breasts and the narrow lines of her small waist. When first he’d seen her in the taproom, he thought she was a fashionable traveler on her way to Abbot’s Holcombe, the resort town farther up the coast. He had no reason to think otherwise. 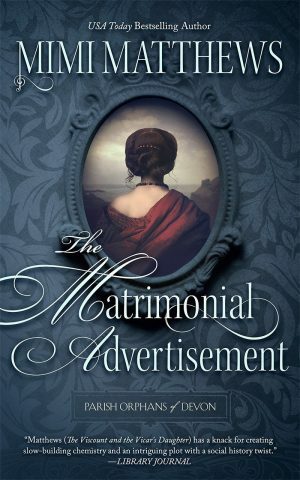 The Miss Reynolds he’d been expecting—the plain, sensible spinster who’d responded to his matrimonial advertisement—had never arrived. This Miss Reynolds was a different class of woman altogether. She sat across from Boothroyd, her back ramrod straight, and her elegant, gloved hands folded neatly on her lap in a pretty attitude. She regarded the curmudgeonly steward with wide, doelike hazel eyes and when she spoke, she did so in the smooth, cultured tones of a gentlewoman. No, Justin amended. Not a gentlewoman. A lady. She was nothing like the two sturdy widows Boothroyd had interviewed earlier for the position of housekeeper. Those women had, ironically, been more in line with Justin’s original specifications—the specifications he had barked at his aging steward those many months ago when Boothroyd had first broached the idea of his advertising for a wife. They were words spoken in frustration after the last in a long line of housekeepers had quit without notice. Words that owed a great deal to physical loneliness and far too many glasses of strong spirits. The literal-minded Boothroyd had taken them as his marching orders. MATRIMONY: Retired army officer, thirty-two, of moderate means and quiet disposition wishes to marry a spinster or widow of the same age. Suitable lady will be sensible, compassionate, and capable of managing the household of remote country property. Independent fortune unimportant. Letters to be addressed, postpaid, to Mr. T. Finchley, Esq., Fleet Street. Justin had initially been angry. He’d even threatened to give Boothroyd the sack. However, within a few days he’d found himself warming to the idea of acquiring a wife by advertisement. It was modern and efficient. As straightforward as any other business transaction. The prospective candidates would simply write to Thomas Finchley, Justin’s London attorney, and Finchley would negotiate the rest, just as competently as he’d negotiated the purchase of Greyfriar’s Abbey or those shares Justin had recently acquired in the North Devon Railway. Still, he had no intention of making the process easy. He’d informed both Boothroyd and Finchley that he would not bestir himself on any account. If a prospective bride wanted to meet, she would have to do so at a location within easy driving distance of the Abbey. He’d thought such a condition would act as a deterrent. It hadn’t occurred to him that women routinely traveled such distances to take up employment. And what was his matrimonial advertisement if not an offer for a position in his household? In due time, Finchley had managed to find a woman for whom an isolated existence in a remote region of coastal Devon sounded agreeable. Justin had even exchanged a few brief letters with her. Miss Reynolds hadn’t written enough for him to form a definite picture of her personality, nor of her beauty—or lack thereof. Nevertheless, he’d come to imagine her as a levelheaded spinster. The sort of spinster who would endure his conjugal attentions with subdued dignity. A spinster who wouldn’t burst into tears at the sight of his burns. The very idea that anything like this lovely young creature would grace his table and his bed was frankly laughable. Not but that she wasn’t determined. Miss Reynold’s eyes lifted to his. He could see the exact moment when she realized who he was. To her credit, she didn’t cry or faint or spring from her chair and bolt out of the room. She merely looked at him in that same odd way she had in the taproom when first she beheld his burns.